Harmony In Harlem return to The Cut Arts Centre in Halesworth, Suffolk, the venue at which we premiered Such Sweet Thunder in 2014. On Saturday 30th March 2019 we will explore Duke Ellington's jungle sounds including Black & Tan Fantasy and The Mooche alongside our repertoire of extic Ellingtonia and vibrant foot-tapping swing, and our recent additions to the band books: soloist features such as Clarinet Melodrama and Billy Strayhorn's harrowing Blood Count. Tickets £15 online. Click HERE for tickets. With a unique repertoire from the greatest jazz composer/bandleader in history, Duke Ellington, Harmony In Harlem are perfect for a wedding celebration, a	Valentine's Ball or corporate entertainment. Our inspiring selection of music ranges from the raw sounds of the jungle to vibrant foot-tapping swing, from the darkest lament to the lavishly romantic, tailored to your needs. Harmony In Harlem can play anywhere in East Anglia, central England or the London area. The bandleader, Michael Kilpatrick, will happily work with you or your venue to arrange whatever is necessary to perform either indoors or outdoors. The orchestra will consider any community/charitable event or professional engagement. Previous performances range from dances for the Cambridge Lindy Hoppers to a private party at the request of a Lord Justice of the Supreme Court of the United Kingdom! 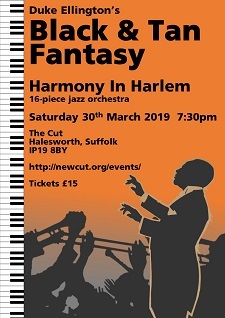 To book the Harmony In Harlem orchestra or to make any enquiries, please contact Michael Kilpatrick using the form provided or telephone 01223 833062. Harmony In Harlem performed at the Plaisterers' Hall for the wedding of a senior Lord Justice, who wrote: "We thought that the band was fantastic - our guests loved it and at least one said it was the best music they have ever heard at a function - I certainly thought so!"